Text By Jim Burnett & Photographs By National Park Service © All rights reserved. Some of the best spots in North America for outdoor photography are also home to bears. Dr. Smith notes, "…we see that a large number of bear-human encounters could have been avoided had people done the right things (e.g., store food properly, make noise while hiking through dense brush, not pushing bears when attempting to photograph them, etc.)." If you do see a bear, keep your distance. What's a safe buffer? Various national parks suggest - or require - anywhere from 100 yards to ¼ mile from bears. Now you know why you bought that great telephoto lens or spotting scope! Ask about local guidelines when visiting parks or similar areas. What should you do if you find yourself in a potential conflict with a bear? Experts have different advice about dealing with black vs. grizzly bears, so check with rangers or wildlife officials in the area you're visiting. In recent years there's been a lot of publicity - and misconceptions - about bear pepper spray. Bear Spray is a last resort defensive measure and not a substitute for other precautions. However, it can help tip the odds in your favor if an attack is imminent. It's essential to avoid confusing "bear spray" or "bear pepper spray" with other pepper spray products. Many people mistakenly purchase and carry one of the numerous personal defense or law enforcement pepper sprays designed for use against other humans rather than bears. The products are definitely not the same! For defense against bruins, be sure you only purchase and carry bear spray products that meet EPA standards and are clearly labeled "for deterring attacks by bears." Carrying the wrong product can create a false sense of security and put you at risk when it doesn't perform as needed during a bear encounter. Bear spray should be carried in a quickly accessible location such as a hip or chest holster. If faced with a charging bear, you don't have time to start digging in your pack! In your tent, keep the spray readily available next to your flashlight. 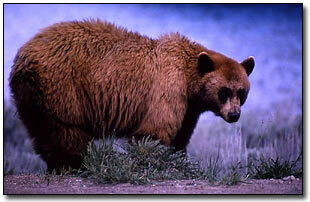 Bear spray should be used as a deterrent only in an aggressive or attacking confrontation with a bear. It is only effective when sprayed as an airborne cloud at an approaching animal. The spray must come in direct contact with the eyes and nose of the bear for optimum effectiveness. This product is not a repellent and should never be applied to people, tents, packs, other equipment or the surrounding area. Research at the Alaska Science Center found that residue from the spray may actually attract bears, even several days after the product was used! For more information on bear pepper spray see on-line articles by Dr. Tom Smith and the Center for Wildlife Information. Finally, what about firearms as defense against bears? Carrying weapons is against the law in areas such as national parks, and many people may be surprised by information from the U. S. Fish and Wildlife Service that "a person's chance of incurring serious injury from a charging grizzly doubles when bullets are fired versus when bear spray is used." The chance to see and photograph a bear in the wild can be a thrilling experience if you follow reasonable precautions. However, in today's world I'll include the disclaimer that the above is for information purposes only, and I can't guarantee that even if you follow all the rules, you're 100% safe from a problem with a bear. So, get accurate information, use good judgment and then go forth and enjoy the Great Outdoors! "Written by a veteran park ranger, Hey Ranger! True Tales of Humor and Misadventure from America’s National Parks takes a fun and informative look at the lighter side of outdoor mishaps and at life as a ranger. The book also provides some practical tips for safe trips to the Great Outdoors. Details are available at Hey Ranger."